Well to start with I didn’t know either, but now I do. I have mentioned previously we are lucky enough in our region to have the springs with the recorded “clearest water in the world”, at Waikoropupu Springs (“water with dancing sands“ ) also known as Pupu Springs. If you weren’t sure about the clarity of the water, world record stuff actually, check out the spellbinding photo left, by Andy Belcher of someone diving in the springs. There are more photos here & here. And as if you need further evidence, here’s another fabulous shot from underneath the water. Unfortunately in recent times diving has been banned. However you can still visit and see the clearness from special viewing platforms. & the salmon bred there, are only available at a few eateries because like most things in New Zealand, with a few exceptions, the rest are destined for export – so as a Kiwi if you can’t make it to Golden Bay then you probably stand a better chance of having it to dine on if you live in London, New York, Paris or Tokyo. With the crystal clear water here, it’s actually no real surprise thats its actually a working Salmon farm. Although entry to Anatoki Farm is free, for a fee, you can catch your own salmon, then have it smoked or grilled & although I’ve hunted high and low I can find no mention of it on their own website, I have to admit the “chilli” version is quite particluar! If you don’t want to eat it there & then, you can have it vacuum packed and put on ice, to take home. ….and visitors sometimes wonder for what reason are local Real Estate property prices a bit higher than other regional type towns,…I can think of many…..
Where is the clearest water in the World? 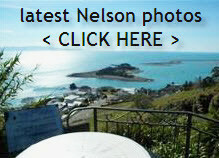 This entry was posted in Nelson and tagged water on December 4, 2008 by David Leggott.